Summer is here and the time is right for another intriguing installment of "A Crafty Life"! I'm Birdy27 and I'm at the helm of this in-depth interview series. 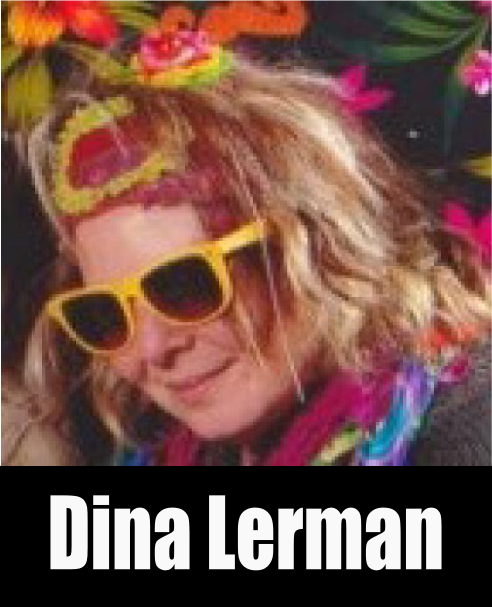 For July, I decided to interview Etsy NY team member extraordinaire, Dina Lerman. If you frequent craft markets and street fairs, you've probably seen Dina, her colorful hair, her warm smile, and her whimsical designs. 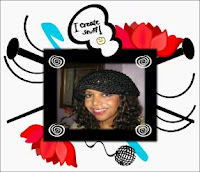 Dina is the creator, Chief Executive "Bug," and Chief "Bug" Officer of the wildly popular Bugged Out LLC. 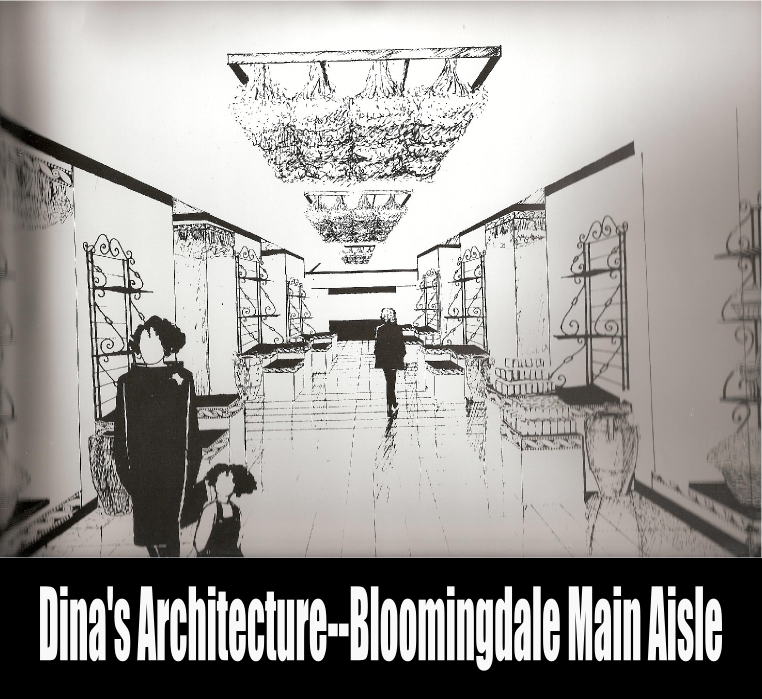 I met Dina at a local market in 2008, admired her designs, and got to know a little bit about her. I witnessed the Bugged Out brand growing over the years and I was pleasantly surprised to see her again after I joined the team. I didn't know the full Bugged Out story, so I was excited to ask Dina how she developed Bugged Out and how it became a bonafide phenomenon. Where did you spend your formative years? I grew up in Rome, New York, which is way upstate in the Adirondack region. I came to New York City--well, actually Brooklyn--to go to art school at Pratt Institute. And I never left! But even way before Pratt, my parents turned me on to New York. They owned a successful furniture business and made lots of buying trips here. I tagged along whenever I could and fell in love with the city. So when it came time to choose where to study, I decided on New York. What was it about the city that resonated with you? I loved going to the museums, and I was super excited about the buildings--the architecture. Plus,I shopped like crazy! The architecture here is fantastic. And I don't think there is a better place to be if you like to shop. I can imagine you with lots of bags in your hands, just loving your life here. LOL! Yes, lots of bags. Please tell us about your studies at Pratt Institute. I studied interior architecture at Pratt, but also took other courses in photography, illustration, screen printing, sculpture, fashion illustration, life study, jewelry, etc. I knew you were an architect, but I didn't know what type. Interior architecture sounds intimidating. Can you share a little about your achievements? I worked in my profession for about 20 years on many high-end residential and commercial projects, at well-known firms, and for well-known clients all over the world. 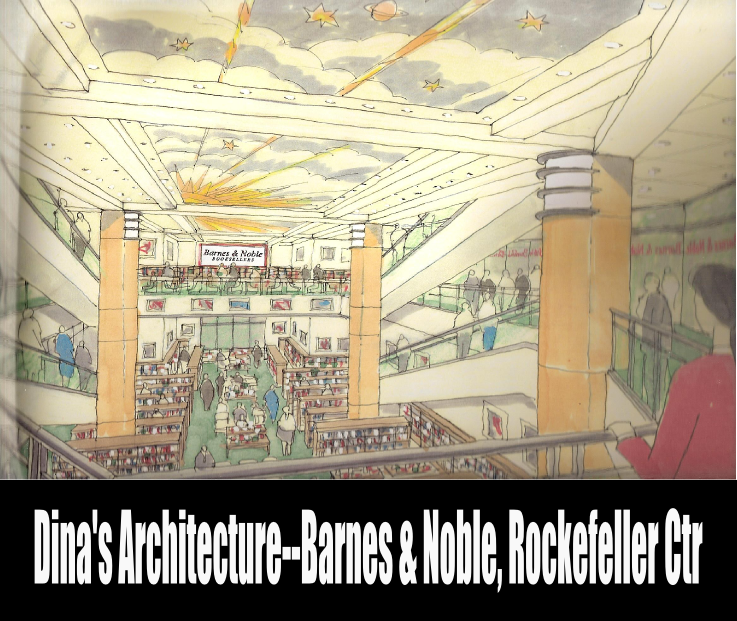 Some of my commercial work includes shops at Rockefeller Center, in-store design at Bloomingdale's, showrooms in the Empire State Building, and interior and exterior work on the SONY IMAX + Cinema Complex in Berlin. Among the high-end residential projects I’ve worked on are a triplex on Fifth Avenue, a condo in the Waldorf-Astoria, a waterfront mansion in West Palm Beach, and combining two old buildings in the West Village. These designs are mind boggling! You were more successful than I imagined. So you were a successful architect, but had these little creatures inside "bugging you" (pun intended) to let them out. Do you feel your training as an architect and the other classes you took at Pratt contributed to the success of Bugged Out? It seems that every thing you studied you now use in your business. Yes, definitely. I’ve had artistic interests since I was little; taking classes gave me more confidence and better tools to do something with them. So I think that part of my business success can definitely be traced back to my artistic interests. I'm amazed at how many things I was exposed to early on that I now use in my business. Sounds like it was the same for you. How did you decide to focus on insects? Have you always loved bugs? Yes, I always have been fascinated with bugs, starting as a little kid, because of their colorfulness and all the different shapes and sizes and intricate details of their bodies. I love their “bug homes,” like cocoons, wasp nests, and bee hives--bug architecture so-to-speak. I see you had the eye of an architect even as a child. 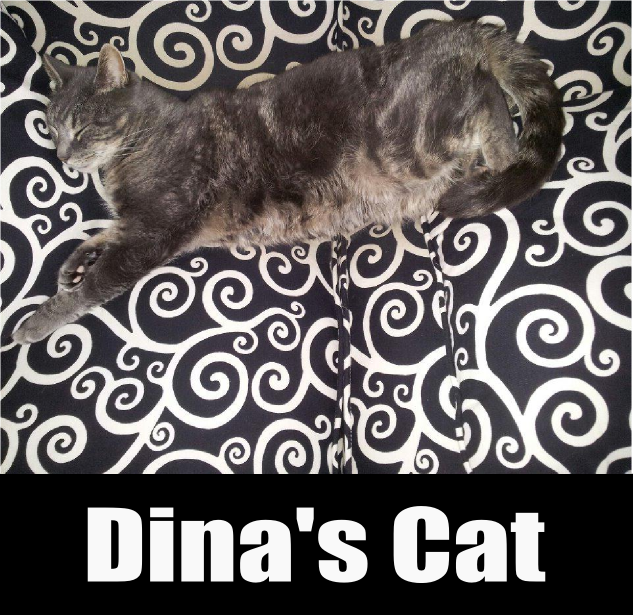 Dina, we have a lot in common; however, I don't like bugs at all. LOL! Well, butterflies are beautiful. Unfortunately I can't say the same about creepy crawlies. But I love your designs. You make bugs look adorable. I have to ask about the name "Bugged Out." It's perfect. The name Bugged Out has a very personal meaning and has to do with my diagnosis with Multiple Sclerosis in 1998. That really bugged me out! I understand. Those two words must have been very difficult to hear. You're right; those two words were forever life-changing. My grandmother had MS and died from complications. Yeah, that was awful. And she was very brave and fought hard. But when I was diagnosed, I made a decision right away: I wanted to do something meaningful. Shortly after my diagnosis I formed a team for the MS Walk in April of 1998 and named it “Bugged Out." 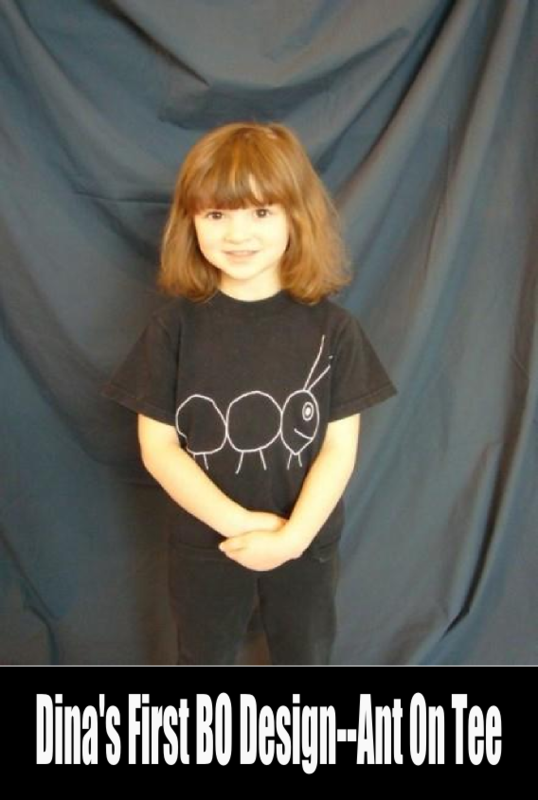 I designed team t-shirts for us with an ant design, and my friends, family, and complete strangers loved them. For several years, the same thing happened with my other bug designs. Many people asked where they could get them and commented how great these designs would be on kids’ clothes. So in 2007 I started Bugged Out, the company. What a great story! I’ve known you all these years and never knew the name had a deeper meaning. May I ask how your health is now? Well, not so great; my MS is progressing. Among one of the worst things for me is that I’m blind in my right eye. The eye itself is fine, but the optical nerve is damaged from MS. In MS the body’s immune system eats away the insulation around nerve fibers in the brain and spinal cord. Imagine an electrical wire without the plastic around it--you’ll get “short circuits," nerve signals don’t get transmitted correctly. Another symptom can be a “funny” feeling for which there is no reason (numbness, tingling, pain). I have that, too. In bad cases people with MS can become paralyzed, and they can even die from it. I'm sorry to hear that it is progressing. Many of us know the term "MS," but don't understand the disease's many challenges. I hope there are new developments on the horizon that will help you. It is hard to deal with this horrible disease. There is research happening and new treatments that slow down the progression of MS--no cure, though. I don't think I'll see a cure in my life time. You're very courageous. I want to focus on your designs for a bit. After I began my t-shirt business, I found a graphic designer who agreed to help me bring my slogans and concepts to life. I'm a writer and I'm always on a budget, so I had more slogans and concepts than I had money. My designer Sara insisted that I study graphic design and now I make a little extra cash. Wow, I didn’t realize how you got into graphic design. It is always fascinating to me how people got to where they are now. Yes! That's one reason I love doing this interview series; I love learning how creative entrepreneurs got their start. I mentioned my graphic design beginnings because I wondered if your situation was similar. You didn't mention graphic design when you listed the classes you took at Pratt, yet it is at the core of what you do. I have no education in graphic design whatsoever, nor do I consider myself a graphic designer. But even though my formal education was in interior architecture, going to Pratt exposed me to so much art education. And I always liked to draw and even took art classes outside of school starting as a little kid. I have always enjoyed free hand sketching, drawing, and illustrating. I also approached architecture in a very artistic way. Some of my architecture clients were very eclectic and appreciated my style. So you draw, but wouldn't consider yourself a fine artist? I love to draw, and I took a lot of art classes. I don’t think that’s enough to call myself a fine artist, though. My mom is very artistic, too, more in an interior designer sort of way. So I would say it’s a mix of my upbringing, talents, interests and education that “made” me into this. All my art is sketched on the computer. My entire Bugged Out bug line was created in my architectural program. CRAZY! Still to this day my graphic designer friends make fun of me for doing my bug designs in such a convoluted way. The fruits and veggies and the "Don’t Bug Me" collection were all sketched in Adobe Illustrator. You have a lot of designs. I understand you have three main collections: BO bugs, BO fruits and veggies, and now "Don't Bug Me" (DBM). Well, so to speak. The Bugged Out line is 12 "standard" bug designs and 12 fruits and vegetables. And I recently created the "DBM" collection of "New Yorky" designs. It includes the bed bug, the cockroach, and three new designs: the mosquito “stinging New York, New York," the “I dove NY” pigeon, and the rat munching New York. It has really taken off! I love your sense of humor. You bring a specific conceptual sensibility to Bugged Out. Your cartoon-style bug, fruit, and veggie faces have a lot of personality and you also use puns and other word play. How did you develop your signature style? Thank you for the compliment about me and my designs. My design style is really based on my personality. I always have been a very colorful and happy kind of person. Even as a kid I stuck out with blue hair at age nine--with the encouragement of my family. My designs are geared toward “kids of all ages." I try to make them very kid-like, but I spend hours on details like the size of the eyes and placement of the pupils, the swirls of bug antennas or carrot greens, line weights and colors. Do you try to keep the colors of the insects, produce, and animals true to life or do you go all "Picasso"? For some bugs and critters, the color choices were obvious: red for the ladybug, yellow and black for the bumblebee, and grey for the pigeon. But for most of the others I picked colors that created a fun collection. I choose custom Pantone PMS Matching System (PMS) colors for all my designs. For the fruits and veggies I chose colors that are true to life. How did you move from creating items by popular demand to a full-fledged business? I started Bugged Out with my bug note card line in 2007. Among my first customers were "The Shop in the Garden" (the gift shop of the New York Botanical Garden in the Bronx) and the Gift Gallery of the Munson Proctor Williams Museum of Art. The NYBG shop is a great store, with a great selection of unique products. You started out with a bang. How did you manage to snag these prestigious accounts? I sent them samples, and they liked my products--very lucky! It takes a lot of confidence in your product to just go for it. I applaud you. I first came to know you through your t-shirts and onesies. But now I see they didn't come first. The cards were my first products and the t-shirts came later. 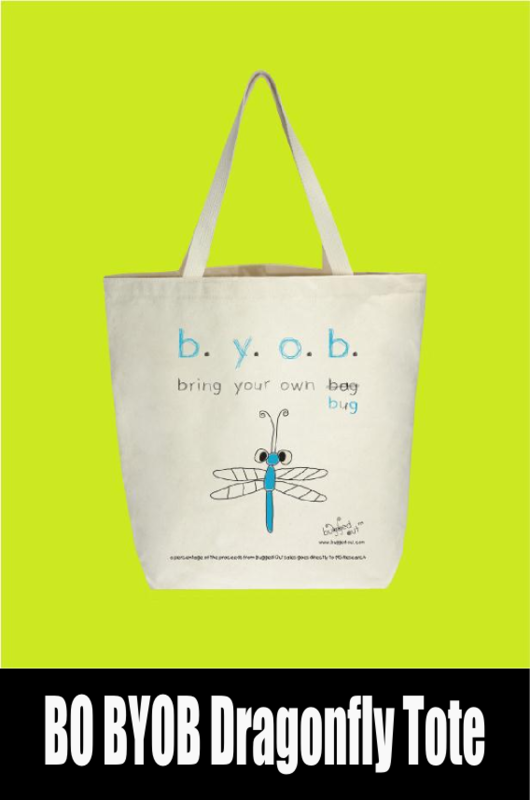 Actually, the BYOB: Bring Your Own Bug tote bags came even before the tees, in 2008. Based on the reaction from the MS walk, you had a pretty good indication the public wanted to "bug out" more and more (again, pun intended). The reaction to my MS Walk team t-shirts year after year–people wanting to buy them right then and there–gave me encouragement. Since then I have always tested new bug designs on note cards first. And if my customers like them, then and only then do I put them on clothing, totes, and other Bugged Out products. 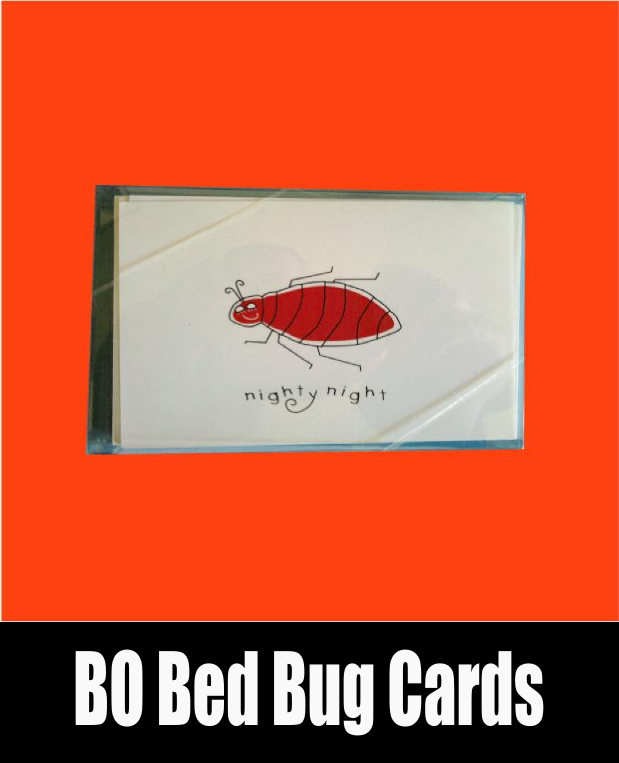 The only design that hasn’t made it off the note cards is the bed bug; it just creeps too many people out! It might end up on night shirts and sheets one day, though. That's very funny. There are a lot of t-shirt, card, and tote bag vendors out there. How do you deal with competition? You can just focus on t-shirts, if you like. 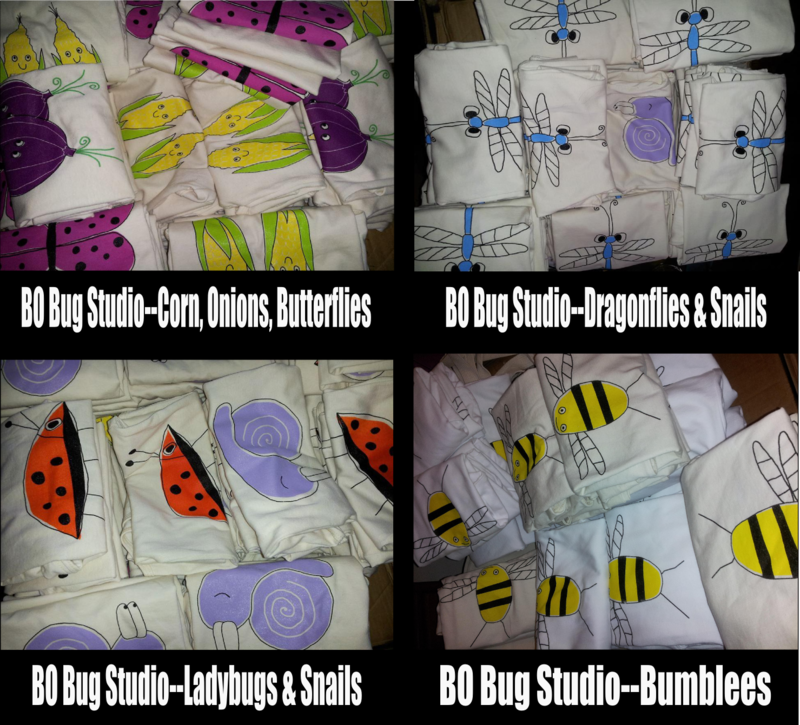 I don’t think of Bugged Out so much as a t-shirt business than as a line of my art. That's a great distinction. I get that. T-shirts are just one of the many products that I offer my designs on. I really look at other t-shirt vendors as peers rather than competitors. But, of course, selling at a huge market with 300 vendors which may include 30 t-shirt sellers is different than selling at a small quaint market with just 10 or 12 vendors. I would prefer to be the only one with t-shirts and onesies there. My unique design style and my business model of using only U.S.-made, natural, organic or recycled products and printing each one by hand here in NYC allows me to reach some very specific audiences. Also, it is important to a lot of my customers that a percentage of the proceeds from Bugged Out sales goes to Multiple Sclerosis research. I give to the MS Care Center at NYU Langone Medical Center. So, back to the competition: it is not really a concern. I love your commitment to MS research. Please tell us about how you moved from bugs to food. 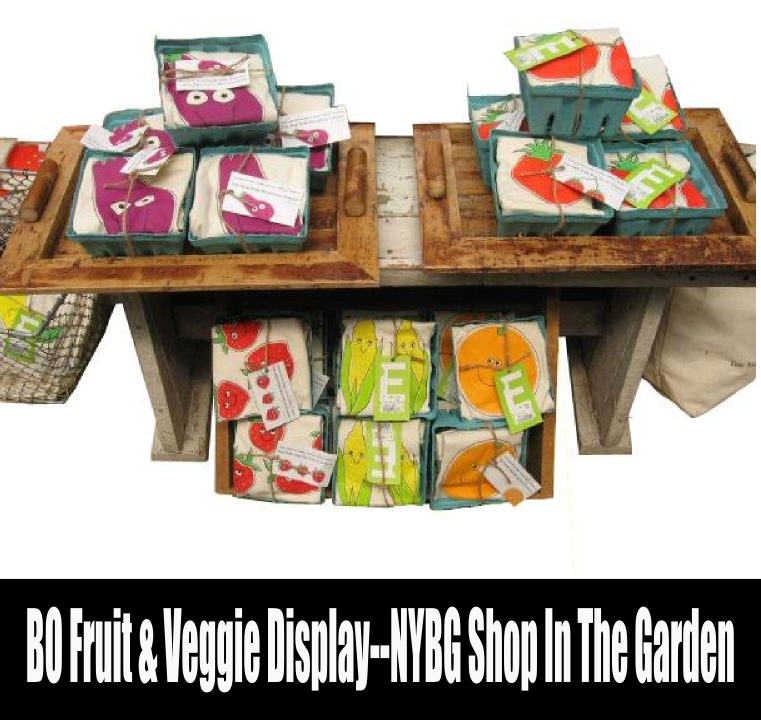 The NYBG liked my bugs so much that they asked me to design a similarly whimsical and kid-friendly line of fruits and veggies on cards, totes, and t-shirts for their season-long Edible Garden Festivals in 2009 and 2010. They had the line exclusively for a while. But once their contract was up and we started selling it ourselves, it became as successful as my bug line at Bugged Out. A lot of vegetarians, chefs, gardeners, and “earthy” people love the fruits and veggies! Since I am mostly vegan, I go nuts for the fruits and veggies, too. Your produce designs work well with the current emphasis on health and well-being. Which designs--bugs or produce--are your biggest sellers? The bugs and fruits and veggies are pretty much equally successful. Some individual designs are extra popular, like the cockroach and the apple, but all do very well. 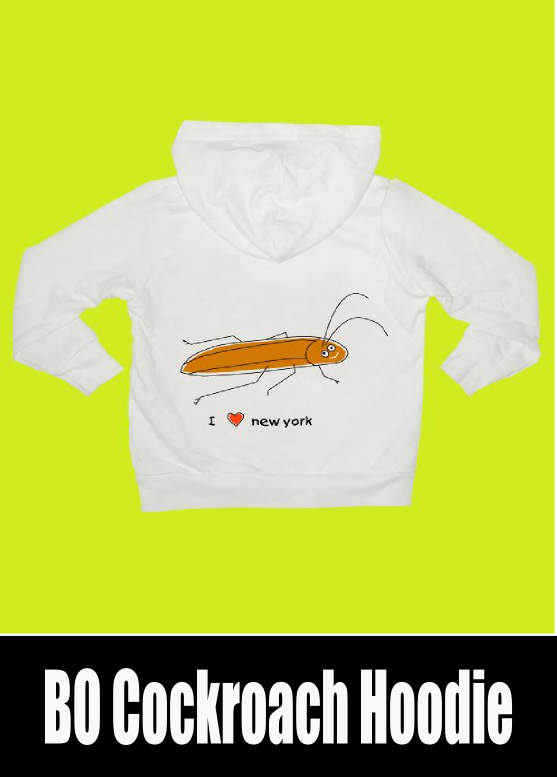 When I added the “I (heart) New York” cockroach in 2010, it became the most popular design in every product line. The cockroach in New York City is the most popular design? Now that's interesting. LOL! What other products do you offer? Over time we have added new product lines like our hoodies and long-sleeve items. And our Scrabble tile pendants came out of a collaboration with Linda from PurtyBird. I've always admired Linda's tile pendants. How did this Etsy NY team collaboration come about? I loved Linda’s whimsical style and colorful products from the first time I saw them at a holiday market in a church in Brooklyn in 2010. 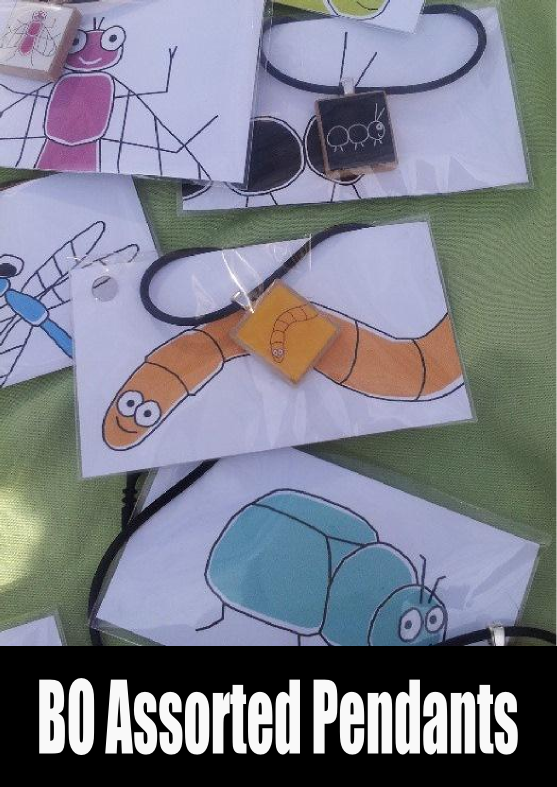 In 2011 we were both selling in the Etsy NY shop at Celebrate Brooklyn!, and later that summer she started making the Scrabble tile pendants with my designs for Bugged Out. We sell a lot of the pendants. Some days we sell lots of totes, other days lots of onesies or tees. And then there are seasonal differences--we sell more hoodies when it’s cooler. But overall all our product lines sell well. With the banning of the use of plastic bags in more and more places around the country, we get more and more requests for our totes. Again, you're right in step with the times. Is running BO now a full-time job? When I started Bugged Out, it was as a side business and mostly on weekends. But it has grown so much that Gerd (the other half of Bugged Out and a solar engineer by profession) and myself nowadays both work full time running Bugged Out. Congratulations! I know it's a lot of work, but it has to be incredibly rewarding to go from one design for a fundraising walk to a highly visible brand. It is very rewarding, you’re so right. The fulfillment is all worth it. Plus, it’s lots of fun! You've had some celebrity customers. Can you share the names of the celebs and what they purchased? We are happy to have the occasional well-known customer at Bugged Out. Among them are Adam Sandler (t-shirts), Steven Tyler (cockroach stuff), Michael Moore (bumblebee tote), Chelsey Handler (grasshopper hoodie), Bethanny Frankel (many hoodies, she’s a repeat customer), Bobby Flay and his wife Stephanie March (t-shirts), SuChin Pak (onesies), Christine Quinn (t-shirts, also a repeat customer). And David Bowie!! David Bowie. Nice! I believe I heard something about Angelina Jolie buying a tote bag. Is that true? Well, almost. The set designer for the movie “SALT” bought it. Angelina Jolie’s husband in the movie is a bug expert and has it in his home office. Yeah, that was cool! Now we have a lot of ant business from that. So many entrepreneurs strive for film product placement and you did it without even trying. And all of this attention from celebrities and the media was a result of doing markets and street fairs? Yes, thanks! It’s really nice when celebrities come by and shop and compliment me on my designs. For sure. There's a strategic element to doing markets. I'm still trying to figure out which ones work best. How do you approach doing markets? What have you learned? We tried a couple of different regular markets as well as some of the big street fairs when we first started. Over time we learned what works for us, factoring in things like neighborhoods, foot traffic, logistics (transportation and storage of our merchandise, hours, parking), and the cost of markets or events. We currently do a regular market in SoHo almost every Friday/Saturday/Sunday (weather permitting) and a market at the South Street Seaport most Saturdays and Sundays. In addition, we do some big once-a-year events. Right now we’re also in the Etsy NY shop at Celebrate Brooklyn! 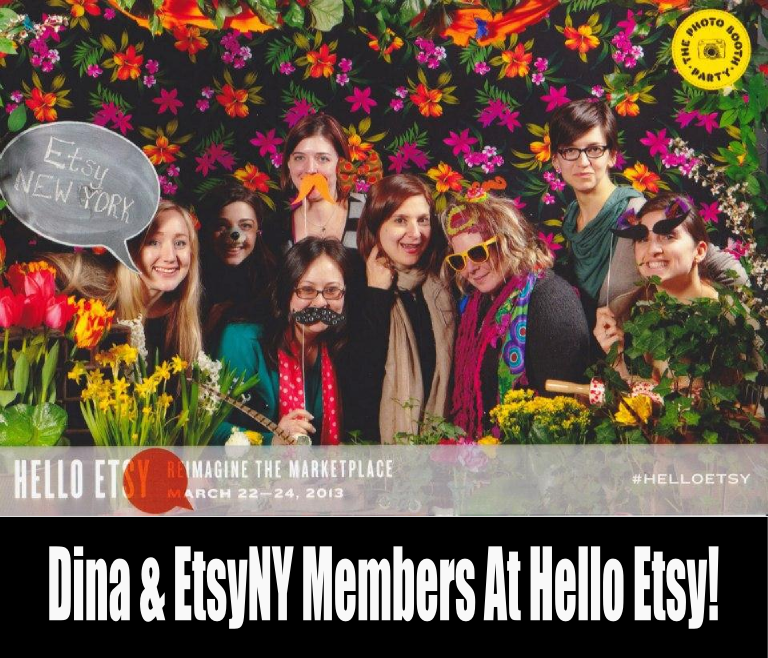 with 16 other Etsy NY members. 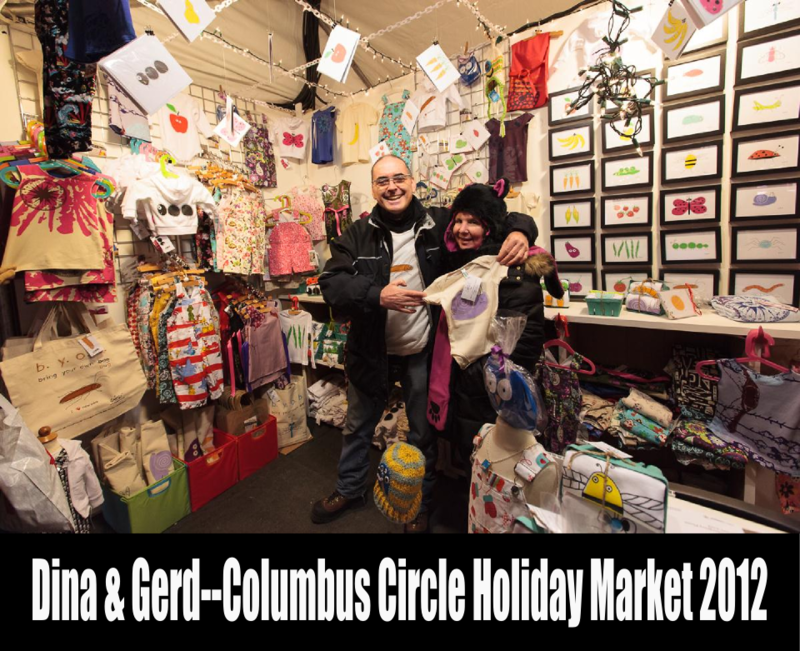 And during the holiday season we do the Holiday Market at Columbus Circle. How are the two of you in so many places at once? Do you have extra help? Currently we don’t have extra help; it is just us handling everything, so we’re usually only in two places at a time. We do a couple of shared events where we don’t have to be there ourselves all the time like Celebrate Brooklyn! for the last three seasons and Governor’s Island last summer. We do have the occasional market help from one or two of my family members. Also, I have one brother who is a year younger than me. We are very close and he advises us on all Bugged Out business. He ran my parents furniture business, and now he is a small business adviser. We are very lucky to have him on board. Let's go back to Gerd. I've seen him in action. He is a master salesman. How do you two work together and split the work load? What does his help mean to your business? Master salesman? Hahaha! In all seriousness, yes, Gerd is the other half of Bugged Out. I would not be able to run Bugged Out without Gerd, especially with my illness and its progression. I handle everything that has to do with design, the website, social media--so all the creative stuff--and I do sell at the occasional market. But it is getting harder and harder for me. So Gerd does more markets than I do, and he deals with the numbers, the inventory, production, and shipping. Although it can be tough at times--we basically never agree on anything. LOL! Yeah, we seem to make a pretty good team. I agree. I'm familiar with silk screening, so I'd love to know about your printing process. Do you silk screen all of your products by hand? What about the note cards? Do you use different printing methods for different products? My cards were at first offset printed. 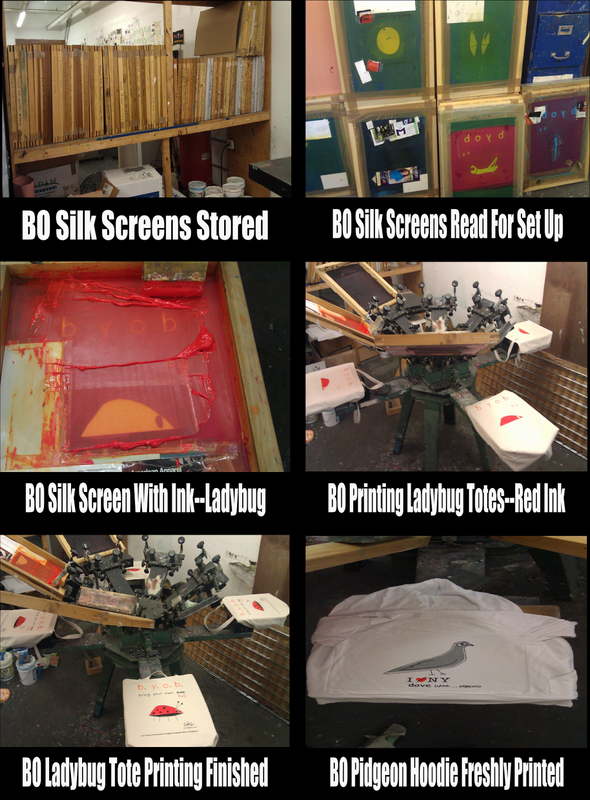 Now we do all card printing ourselves out of the “bug studio” and all screen printing out of our shop in Long Island City, Queens. Wow! Thank you for this glimpse into how the products come to life. 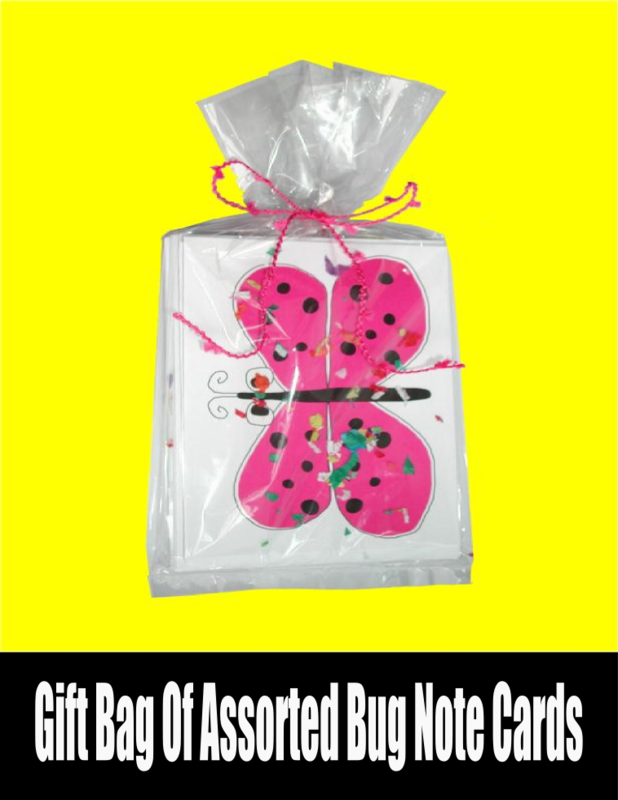 You certainly have more control over your inventory when you do your own printing. Where do you live? You call your apartment "the bug studio." It's certainly bug infested. LOL! What goes on there? We live on the Upper East Side of Manhattan in a studio. Our home has really turned into the bug studio. We do all Bugged Out related work here--designing, production other than screen printing, shipping, and the occasional freaking out. Well, we actually do more than the occasional freaking out! When you're an indie business owner there's always a lot to do. How do you manage your time? Time management is hard. But we make it work. Our week is dedicated to studio production and printing time. And our weekends are all about markets. When holiday market season comes around it becomes grueling. We kind of expect to never get any sleep. It is all production and market time for about two months straight. Yes. I understand that. There's so much ground to cover with you! What about branding? One of my issues is that I don't have a recognizable brand. My designs/slogans/concepts are all over the place. But branding is so important, especially today. Did it come easily to you? Branding can be super hard. In my case, the branding already started with the MS Walk team t-shirts. I had my team name Bugged Out and a few bug designs, and I created a team logo with a bug face and antennas incorporated into the “gg” of Bugged Out. Even though I didn’t have any plans of selling anything back then, I knew I wanted a consistent concept, something recognizable year after year at the MS Walks. This concept became the brand Bugged Out. I’ve copyrighted and trademarked the name, logo, and designs. You're totally on top of the business end. How did you deal with the copyrights and trademarks? When I started Bugged Out I worked with a patent attorney, the late dad of a friend of mine. He was also very knowledgeable in intellectual property law and helped me a lot. It was a years-long and complicated process. It's an expensive process, too. And you continued the branding with your hang tags and pulp containers. Very smart. We have to spend a little time on social media and its increasing importance. How do you deal with it? Has it helped your business? Do you have a blog? I don’t blog, but I Facebook BIG TIME. And I tweet and Instagram quite a bit, too. We’re also on Pinterest and Flickr. I believe social media definitely helps our business; our Etsy shop statistics show it does. I find social media to be a great way to market and advertise my business for free. Nothing beats direct contact with our customers, though. You mentioned the Columbus Circle Holiday Market. Is it a good one for you? I know the hours are incredibly long. The Columbus Circle Holiday Market is great for us. 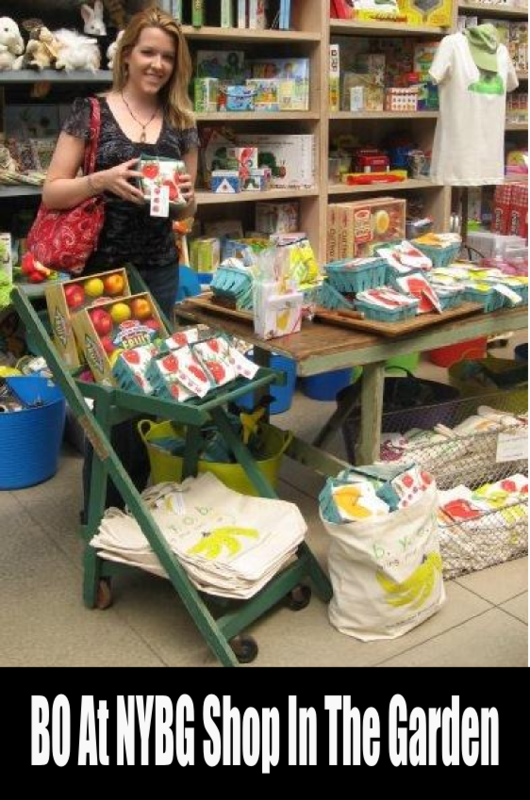 We have a shop there called Lil’ New Yorker with kids and baby products by local designers from Etsy NY. It is a fun shop and people love it. Yes, from the stressful life of an architect to this. The long, long hours and hard work are not much different. But some how it is very fulfilling, and it pays off. Look at how you managed to get so much into a small space! How do you pull it all together? Any advice for those of us--like me--who are "display-challenged"? At any given venue I incorporate whatever I find, with my product always being the focus. I had to come up with a very simple basic setup. We have to fit all the equipment and merchandise for two markets in our little car--the bug truck! So we use tables with colorful tablecloths, kids' clothing hung along the front and from a clothes line above. On the table we have some tote bags standing up, some flat, along with note cards in different packaging options, the pendants, and a couple of laminated sheets showing all my designs--SIMPLE! Simple? LOL! Well, you obviously have an architect's eye for using space in an effective and eye-catching manner. How do you fare on Etsy? What about direct sales from your website? Or do you do best at markets? We don’t do badly on Etsy, considering that we don’t put a whole lot of effort into it--yet. We are learning about tagging, search-engine optimization (SEO), and promoting our Etsy shop. We are in the process of redoing it to make it more effective. We also have our own website; it’s not eCommerce yet, but has links to the Etsy shop. However, the biggest portion of all our sales happens at our markets and other events. Besides the museum shops you mentioned earlier, do you have other wholesale accounts? Yes, we do wholesale. And while we do appreciate our wholesale accounts, we prefer the retail route. 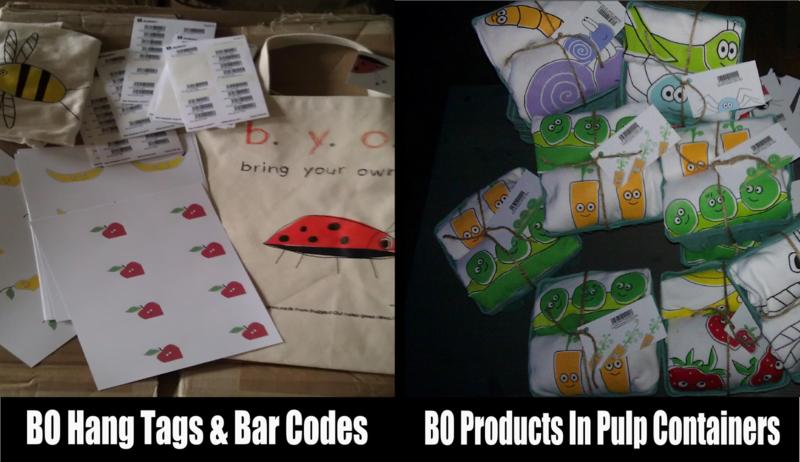 We are finding the best way for Bugged Out is being out there selling in person to customers at markets. I understand the NYBG approached you about creating another design. 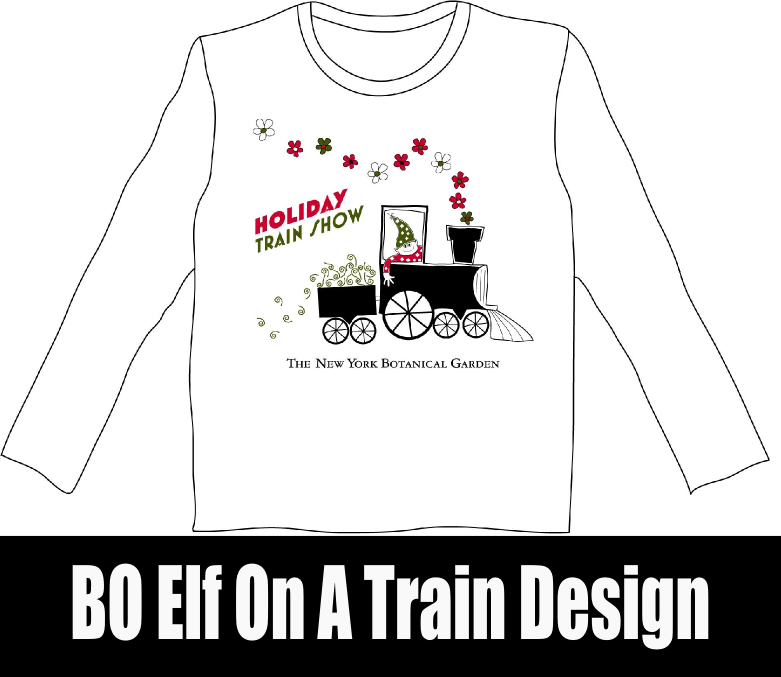 Yes, in 2009 I also exclusively designed the “elf on a train” T-shirt for their Annual Holiday Train Show. And in 2012 I created a series of Pinocchio scenes to accompany an exhibition of Jim Dine's Pinocchio sculptures and illustrations at The Nassau County Museum of Art. That's super exciting. So museums love you, celebrities love you, and regular folks love you. Do you have a "typical" customer? Aww, that’s sweet of you! We don’t really have a typical customer. Our customers are all ages, nationalities, backgrounds–parents who are expecting and already-parents, grandparents, aunts and uncles, brothers and sisters, people who care about the environment, people who want something unique and/or handmade, people with a Multiple Sclerosis connection, etc. About 3/4 of our customers are female. About 1/3 are New Yorkers or from the metro area, 1/3 are tourists from the U.S., and 1/3 are visitors from all over the world. So everybody's buggin' out. (I couldn't resist.) I know some of your products are made from organic cotton. Which ones? How did you decide to go organic? Do you feel your customers make the decision to purchase based on a commitment to organics? 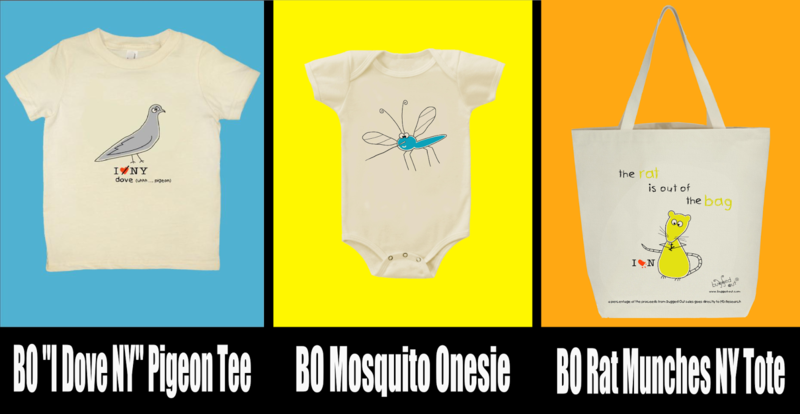 Our short-sleeve t-shirts and onesies are organic; for us it’s just the "environmentally responsible" thing to do. For the same reason our tote bags are made from 100% recycled cotton canvas. 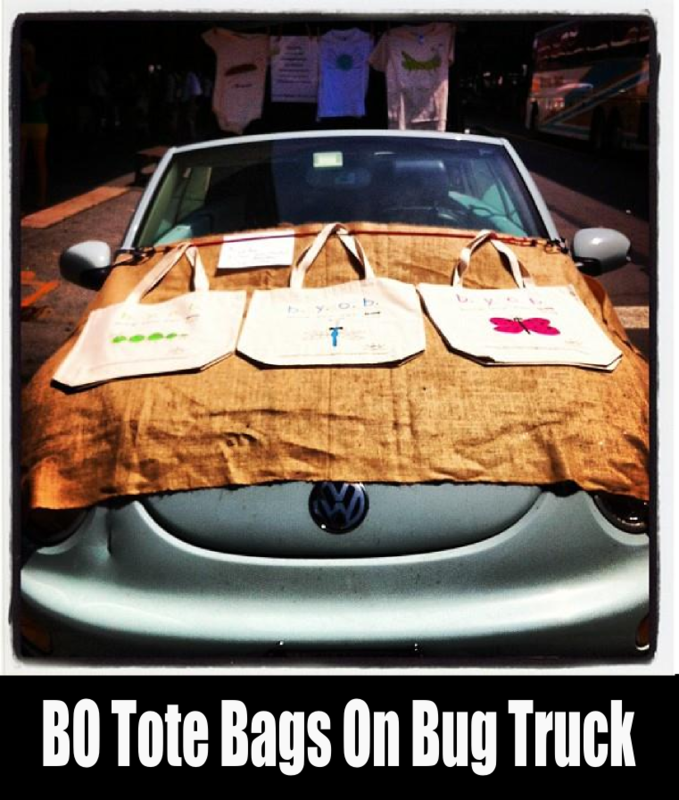 Our customers definitely appreciate the organic and recycled materials. Most of my interviewees have pets, so I started asking about pets for each interview. Do you have any? Well, kind of. I do, but not in my apartment here in the city anymore. I have a cat named Chaos who lived with us, but now lives the life of a princess with my parents in a big country setting with another cat and two dogs--all boys. I love animals! I must be the only person without a pet. Where do you see your business in five years? Totally Bugged Out in a good way. LOL! But seriously, hopefully soon we’ll have a small Bugged Out store. A BO boutique is a great idea. Although I have so many other questions I'd love to ask you, it's time for the last one. 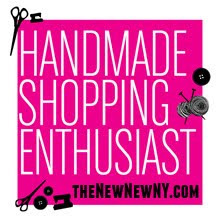 How has being a member of Etsy NY helped you and your business? I think Etsy NY is a great community. I learn so much from being a member. It is a wonderful platform for sharing ideas and learning more about small business from others in the same situation. I play an active role in Etsy NY. 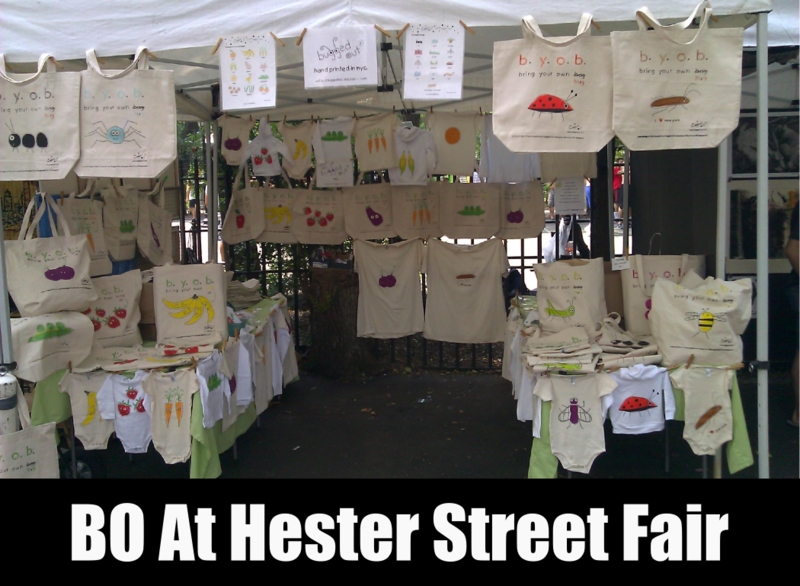 Currently I am the Team Coordinator for the Hester Street Fair (HSF). I publish the application forms and assign the spaces in the shared Etsy NY tent at HSF. I try to answer everybody’s questions about HSF and I’m the liaison for the organizers.I also frequently design graphics for postcards, posters, web banners, etc. 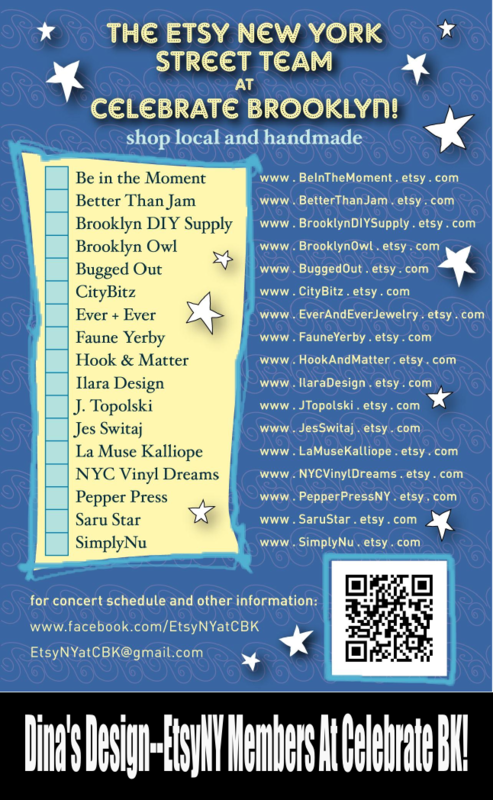 for Etsy NY events such as Crafts in Chelsea and Celebrate Brooklyn! Yay Dina! I am glad my unsolicited biz advice worked for you...lol! Wonderful interview, wishing you continued success! Wow, what an awesome interview. Dina is an amazing, inspirational entrepreneur and I love her work! What a great read and the designs are so fun. I'm inspired to try more markets now to see how I fare. I love the Bugged Out designs! I met Dina and Gerd at a craft fair several years ago. I loved Dina's spirited personality and thought they were two of the nicest people around. 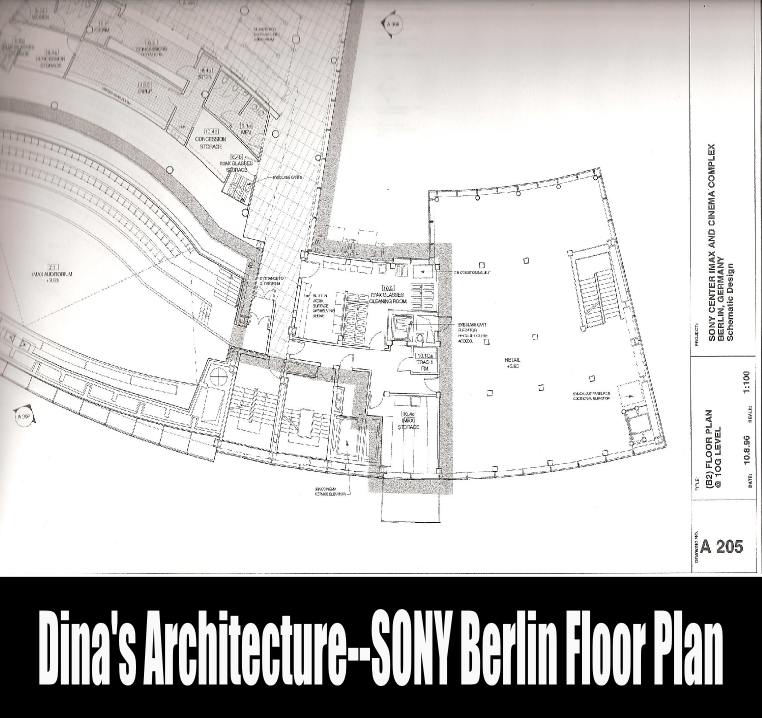 Dina, I knew you worked in architecture but did not know how many high end clients you had. You've been successful in everything you've done! Love Dina's bugs. What a great interview! Very inspirational. Thanks a mil Dina for sharing and Alicia for asking thoughtful questions.